Coupons can be used for your customers to get discounted access to your membership plans. Rule of thumb: For coupons for the recurring portion of a membership plan create the coupon directly inside your Stripe account. For coupons that apply to a startup fee or a fixed length membership create a coupon inside your Training Tilt site. Note: Currently coupons can only be used for your customers to apply against either "startup fees" on a recurring membership plan or the "fixed price fee" of a fixed length membership plan. Additionally these can only be used for membership plans using the Stripe payment gateway. We've implemented this as a workaround as Stripe don't currently support applying their coupons against one-off charges. You can still use a Stripe coupon to give your customers discount on the recurring part of a membership plan. 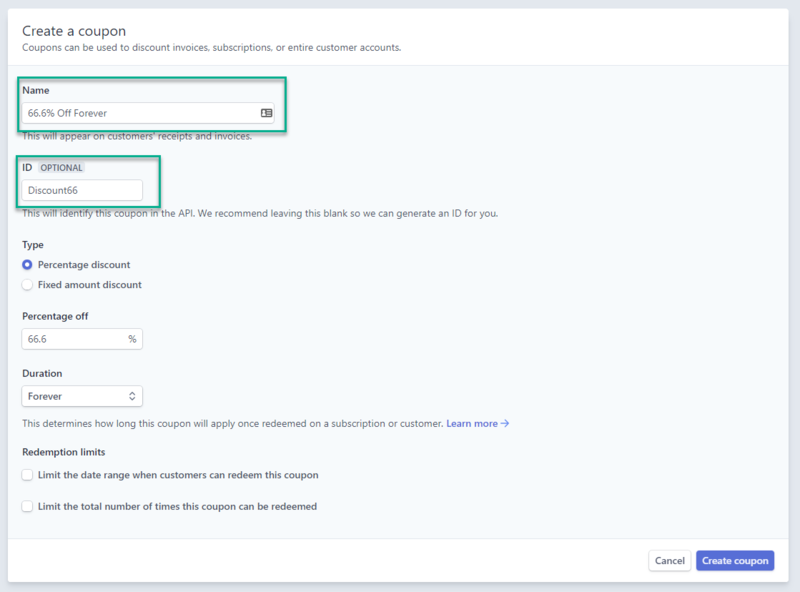 You can create that type of coupon directly in your Stripe account. Log in to your Stripe account and select the coupons option under the "billing menu". When you create a coupon you can specify a name and an id. It is the id field that your customers will need to use when they use a coupon. The name field is for display purpose only. There are two ways to configure a coupon here. Either as a dollar amount in which case the coupon can only be applied against a membership plan with the same currency or a percentage discount which can be applied against a membership plan of any currency. To create go to the "Coupons" option from the E-Commerce menu.